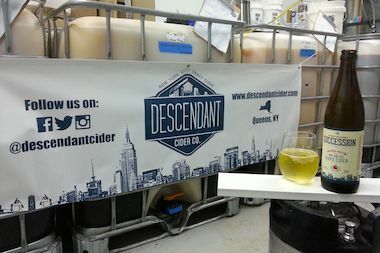 Descendant Cider Co. of Maspeth will launch at the Queens Kickshaw Friday to kick off Cider Week in NYC. ASTORIA — Take a sip of fall flavor in Queens this week as a new hard cider brewer, or cidery, makes its debut as part of a series of events marking Cider Week. Descendant Cider Company will launch Friday night at The Queens Kickshaw in Astoria, where patrons will be able to sample pints of hard cider from the Maspeth-based company. Husband-and-wife owners Jahil Maplestone and Alexandria Fisk, of Cobble Hill, make their ciders at their production space at 52-05 Flushing Ave. and hope to eventually expand to a larger facility. Maplestone said he started out homebrewing beer before getting into cider-making, though the two processes differ greatly. "Cider is more comparative to wine-making," he said. Descendant is one of eight companies in the state operating under a special license created last year for cideries that use New York-grown apples, according to a recent announcement from Gov. Andrew Cuomo. There are now 29 cider producers in the state compared to five in 2011. "There's such a great apple industry in New York," said Maplestone, saying the couple uses apples from multiple locations. Some of their cider blends are made with a single variety of the fruit while others can contain as many as 20 different varieties. "We have a whole bunch of farms we work with, anywhere between here and Albany," he said. He also noted the city's growing craft cider scene, with the drink gaining popularity at local bars and restaurants. "Cider is becoming a thing and it's really starting to grow," he said. Descendant Cider will be on tap at The Queens Kickshaw starting Friday, with a launch party taking place from 9 to 11:30 p.m. The event will kick off the Astoria restaurant's Cider Week celebration which will run through Nov. 2 and include a "tap takeover" that will feature six different ciders on draft. There will also be cider-paired dinners on Oct. 28 and 29 that include five courses for $65, as well as a Halloween event that will feature cider from Rowen Imports on Oct. 31. "We get a lot of people coming here specifically looking for ciders," said The Queens Kickshaw's owner Ben Sandler. "We also see that people's taste in cider has shifted as well," he said. "Now they're definitely gravitating more towards drier ciders, and more toward local ciders." The Queens Kickshaw is located at 40-17 Broadway in Astoria. For more information on its Cider Week events, visit their website.